The United States passport application form you submit will depend on the type of service you need, whether it is a new passport, passport renewal or something else. If you are unsure which passport service you need, visit our Passport Information page. 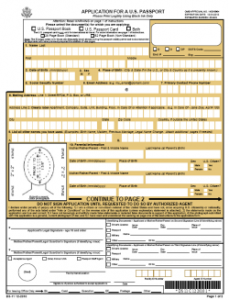 Instructions for completing each form can be found on our website as well as included with each passport application. It is very important that you follow the instructions carefully. An error or an illegible form can lead to delays in the process. Normal processing takes up to six weeks while expedited servicetakes up to 3 weeks. Applicants who require emergency service for urgent travel need to either schedule an appointment at the nearest regional processing centeror request the assistance of an authorized passport expediting service.You can download the passport applications you need below. The forms are available in PDF format. You will need Adobe Acrobat Reader to open and print each form. You should already have this program on your computer. If you don't, you can click the link to download Adobe Reader. Download the DS-3053 Statement of Consent Application Form this fillable PDF document is used when parents would not be able to present the child passport application to the acceptance agent. 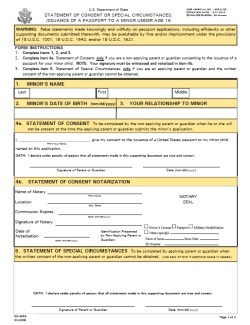 The State Department requires that parents or guardians fill out the DS-3053 Statement of Consent Application Form. You will need to get a witness and have the document notarized. The application form DS-82 Application for Passport Renewal by mail is used when renewing a United States passport that is expired or near the expired date for no more than five (5) years beyond the expiration date on the passport. 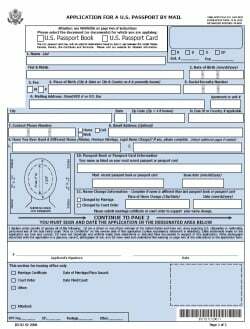 The DS-11 Application Form for New U.S Passport is an application form that should be used when you are applying for a new U.S. passport or when you are replacing an expired U.S. passport that was issued to child under the age of sixteen; Or for a lost passport. Passports and Visas.com will help you getting an expedited passport. It's easy, painless and fast.